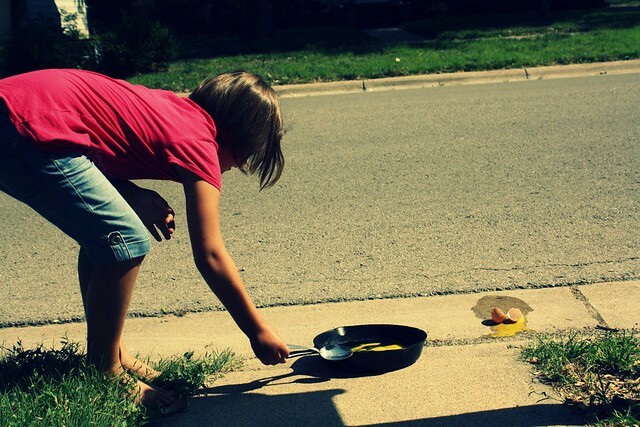 so, thanks to a friend’s status update on facebook, i had an immediate childhood memory of our neighbor, nancy, frying an egg on her driveway. i thought that just beyond our weeping willow tree, in the jungle of urban streets and sidewalks and paved slabs, it stayed in a little pool that turned white with a sunny yolk standing tall in the center. i thought she and my mom stood balancing on old railroad ties in their tube top sundresses laughing and exclaiming over it. i’m starting to think i might have created that memory. 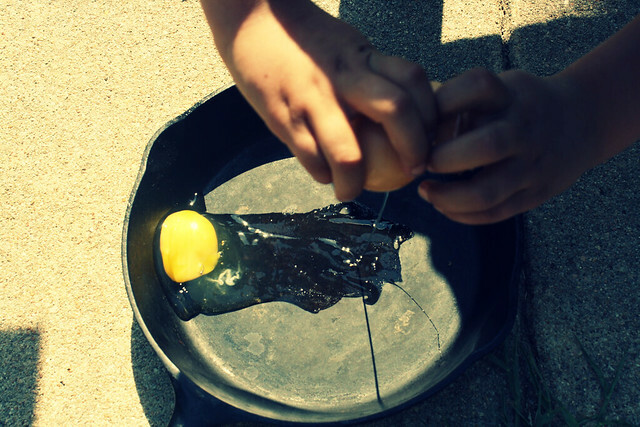 but earlier today when i still believed it, i was motivated to fry an egg on our sidewalk! 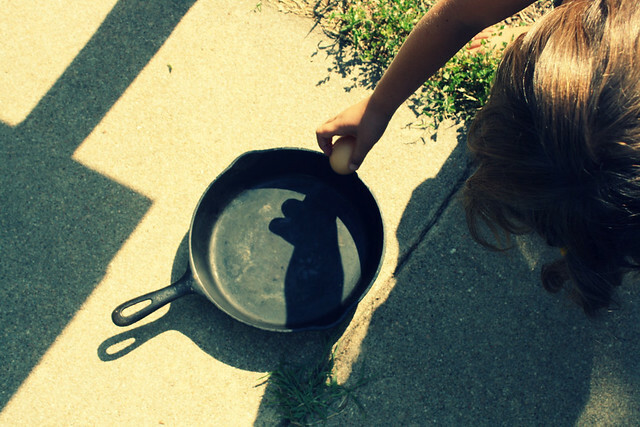 we set the skillet in the sun at 12:45. a few hours later (after we were done with our very first time volunteering at the thrift shop…woot! i love this place more than i did before!!! ), we got the eggs. and why oh why do i carry the expectations i do? i believed there would be sizzling. i believed there would be a yolk firm in the center and a quickly growing white puddle around. nope. 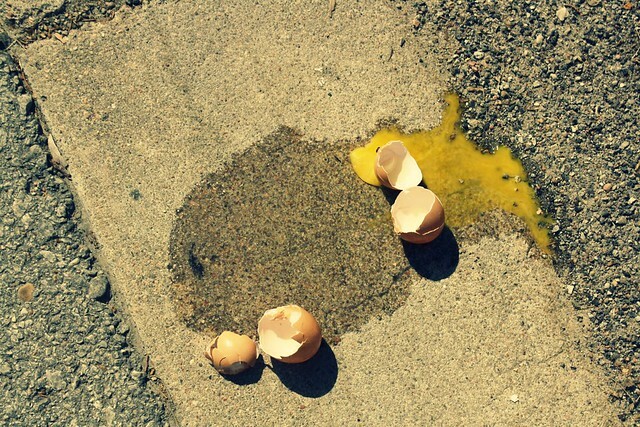 so we cracked one on the actual sidewalk (just in case there would be some, well…sizzling). nope. 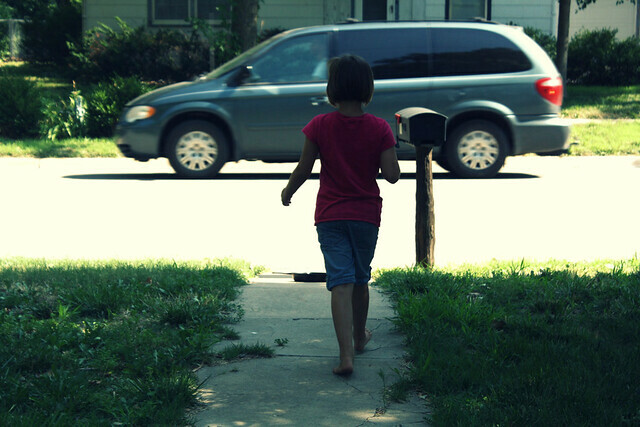 so we waited and we watched. it was hot. hot hot. we stirred. and checked. and stirred. then we went to micah’s last ballgame (go team), waited for naomi to get home from a babysitting gig (my heart warmed that she took a bag of toys to entertain in the 100+ heat), went out for frozen yogurt (thank you online deals), got home and went to check again. well, no liquid, but no white either. 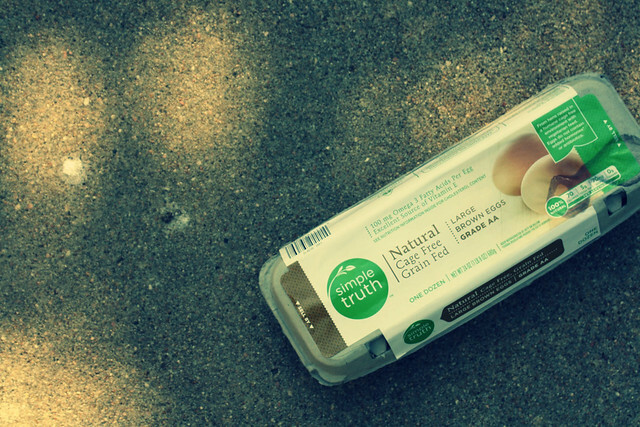 no solid round yolk. and honestly, was it cooked or just dried out? 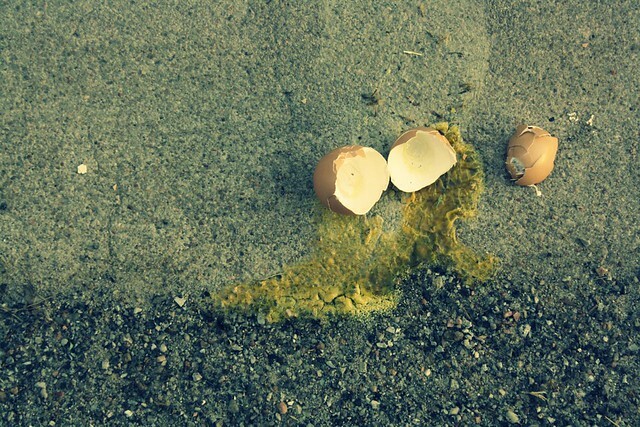 silly me, i really believed we’d eat our cooked-on-the-sidewalk eggs for supper. 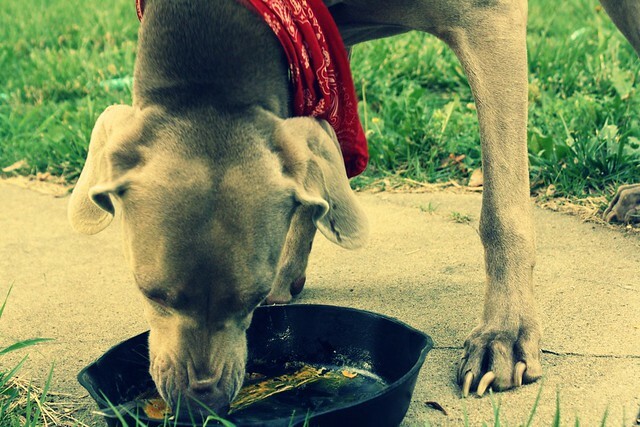 we did it on the stovetop instead. though sally got to it and i assume she’ll be fine. 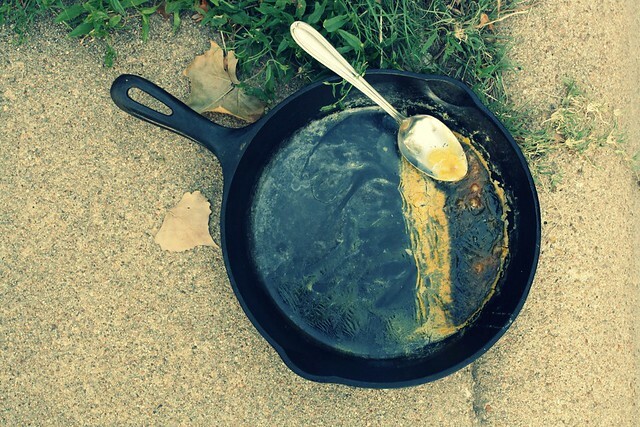 any frying-egg-on-the-sidewalk experiences to share? Sally will be just fine. We have caught our dogs stealing eggs straight from the coop. And this was awesome! Thanks for sharing! 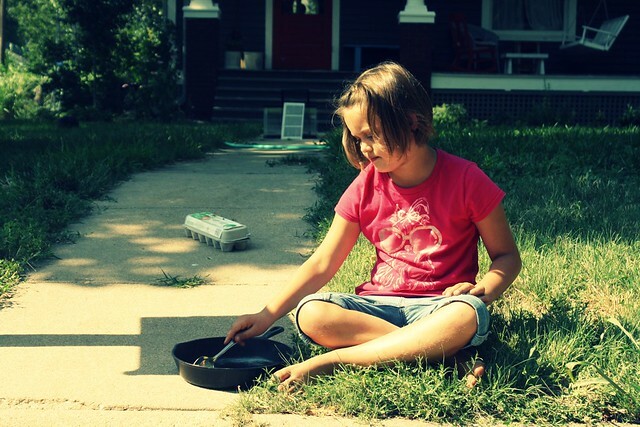 No egg frying to share, but so glad your family is volunteering at the thrift – every volunteer is a great blessing! Tried it last year. Same for us. No luck. And I too truly believed it would fry. I mean it was SO hot!